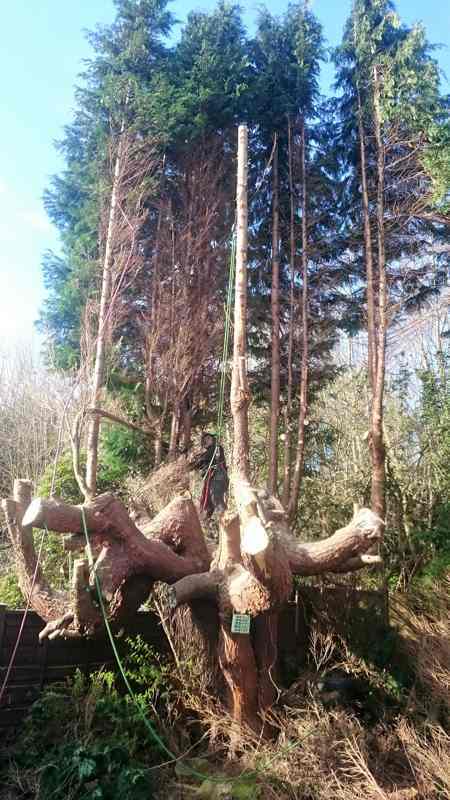 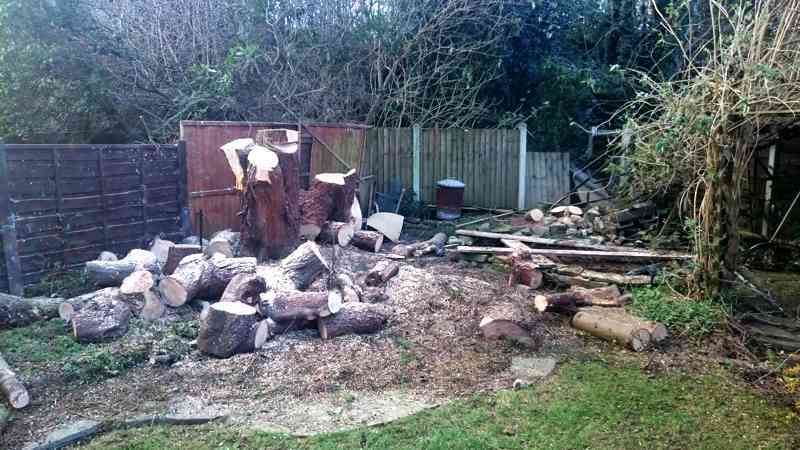 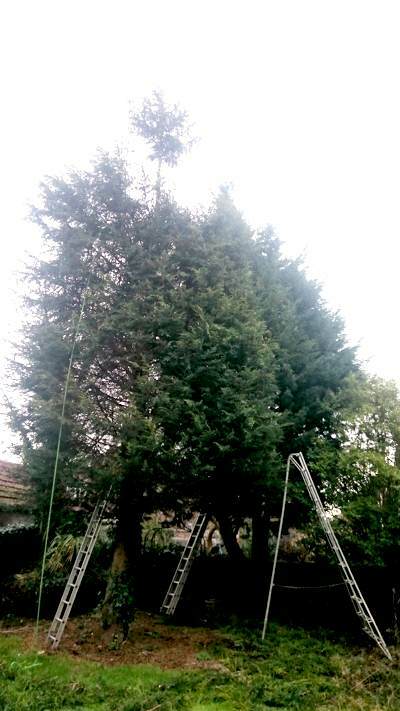 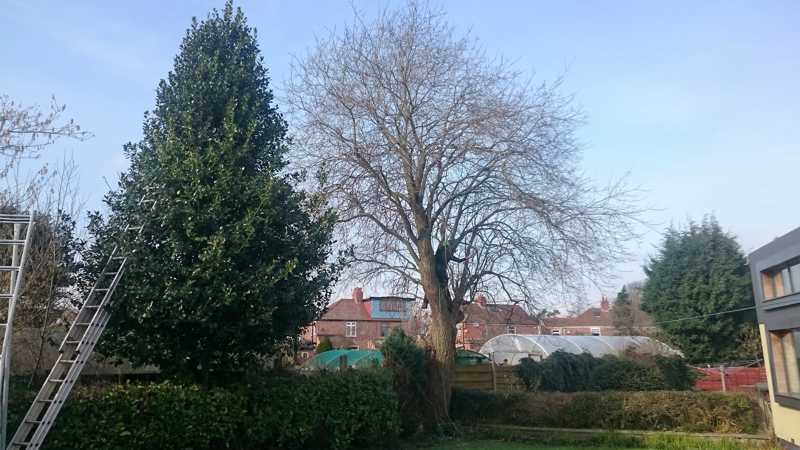 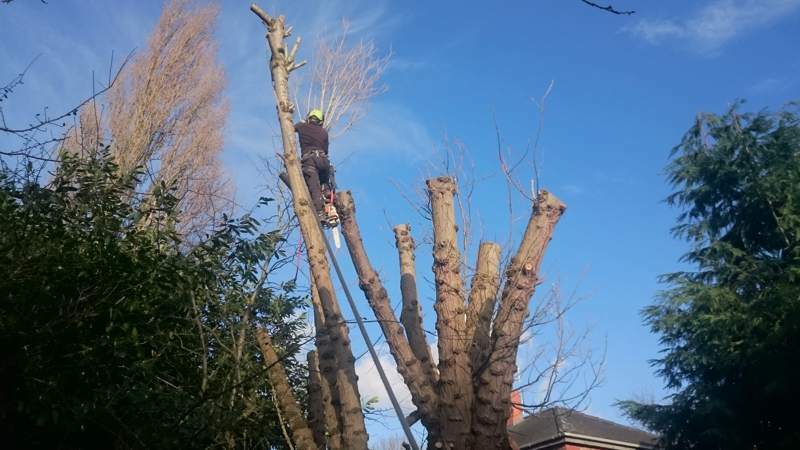 We were tasked with the safe dismantling and removal of a huge conifer, a large spruce and a few smaller trees from a back garden in Withington that was suffering from a serious case of light deprivation. 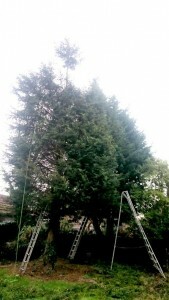 The conifer was less than 40 years old but had managed to grow to a substantial size in this time, with a diamtre of over 3 feet. 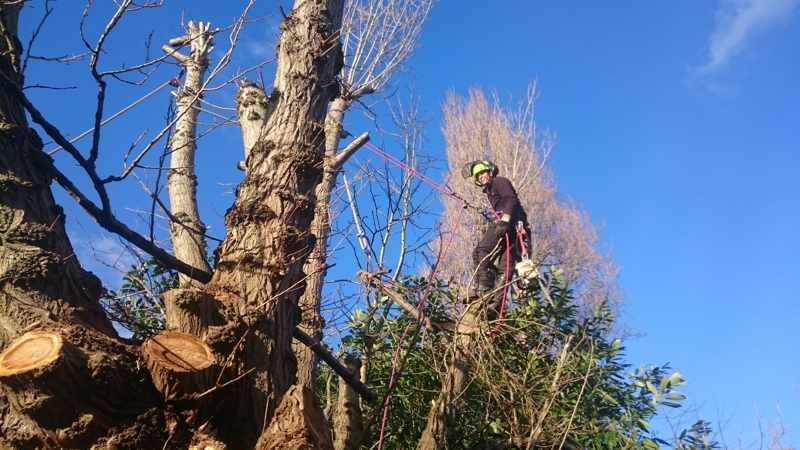 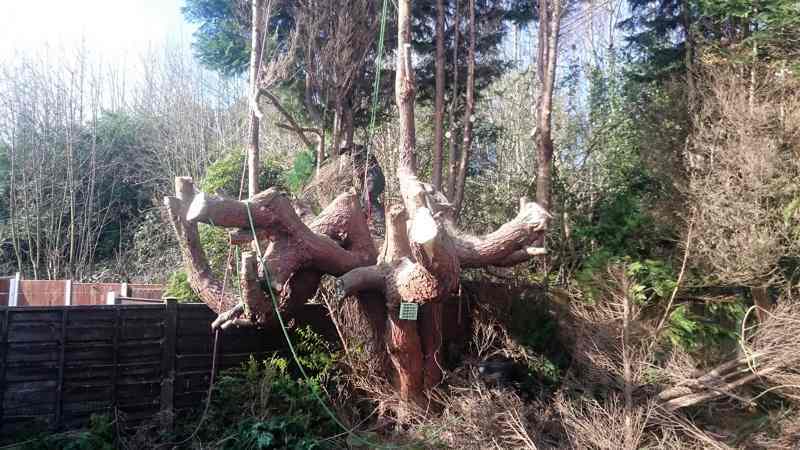 The trunk split into four large stems at a height of around 15 feet and grew up to 50 feet high with a significant spread due to the multiple stems. The spruce in the foreground has been de-limbed first to make plenty of room for the big tree removal. 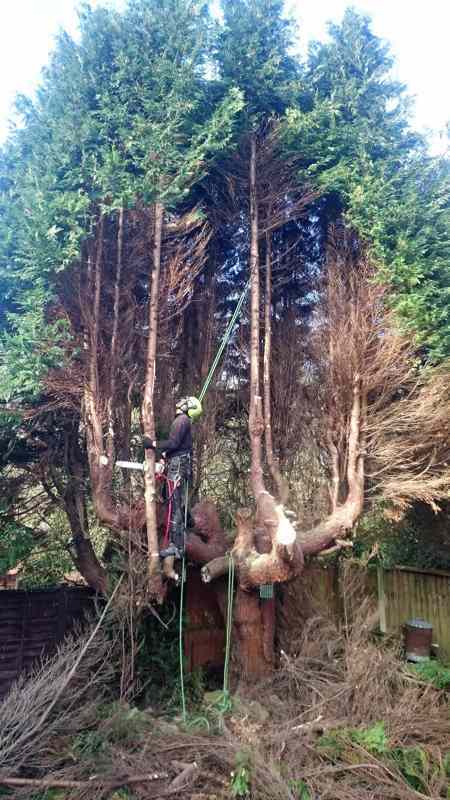 It was important to get this job done outside the bird nesting season given that conifers are an absolute favourite for wood pigeons, who will regularly have up to three broods in a single year. Extra large pine cones for sale for £1 each. 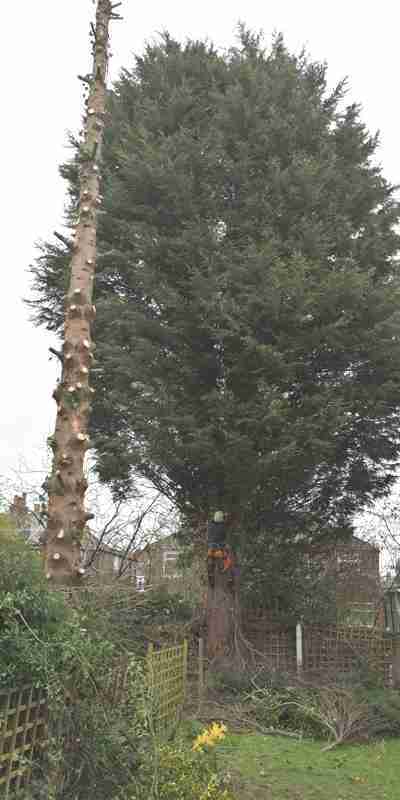 These cones came from a Stone Pine we removed from a garden in Bowdon this summer. 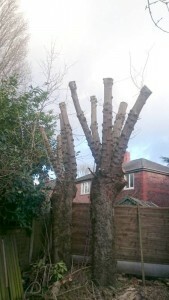 The cones are currently closed and around 10cm in length. Under each scale are two edible seeds known as pine nuts housed in their own separate protective shells. 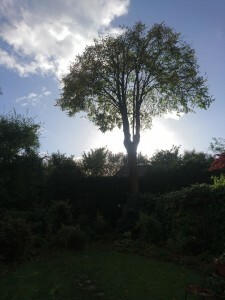 These seeds can be planted out in a bit of compost in late winter/early spring. Germination of the seeds may take a few weeks, then watch as they grow into fantastic new trees that may one day produce their own crop of cones. 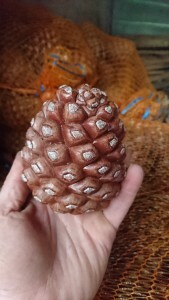 Large pine cone from the Stone Pine. 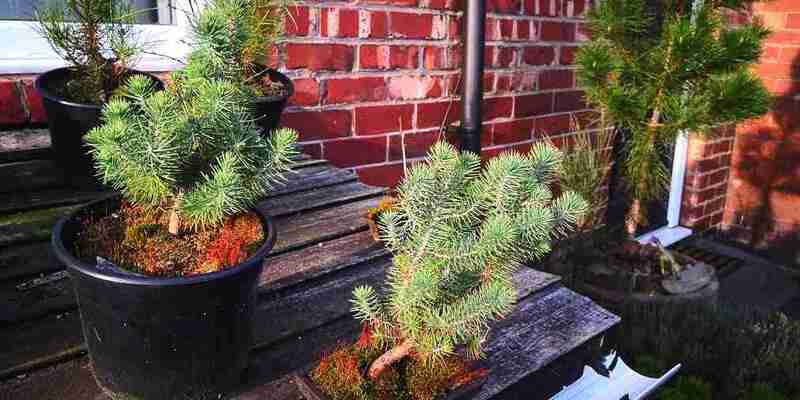 The cones also make great festive decorations for around the house and on the Christmas tree so please get in tough through the contact page if you would like any. 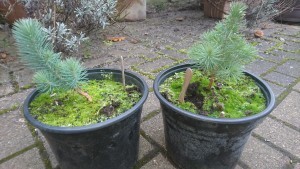 1 year old Stone Pine seedlings. 2 year old Stone Pine seedlings. 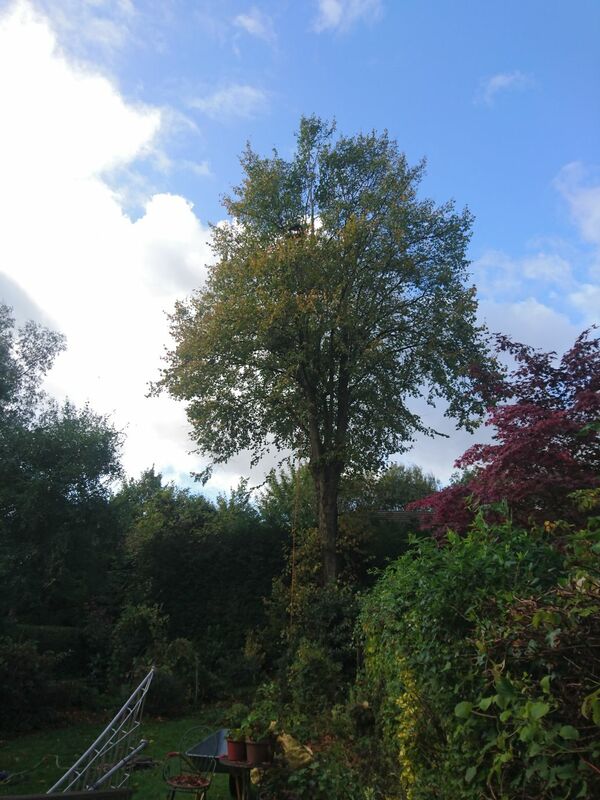 A crown reduction and crown lift was required on this large lime tree in Whalley Range to allow more light into the garden. A large portion of the back garden was suffering from lack of light due to the big lime tree canopy casting a lot of shade. Seth climbed the tree and reduced its crown by approximately 30%. He lifted the canopy slightly by removing a few of the lower branches and the epicormic growth on the trunk. 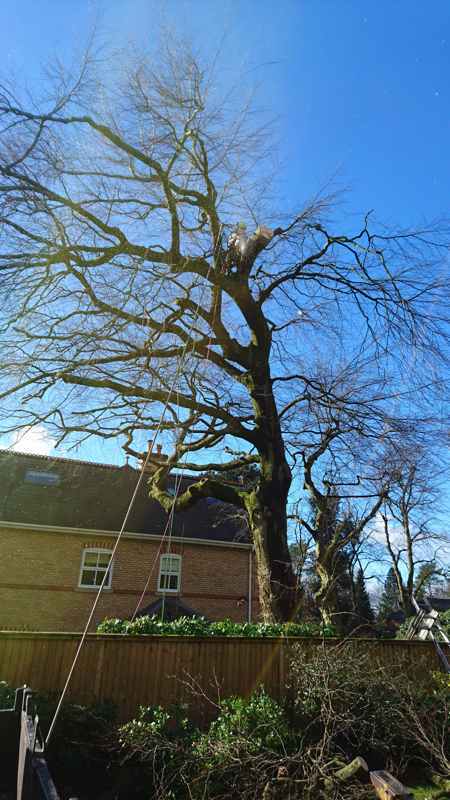 This allowed the afternoon sun to penetrate the garden between the crown and the top of the hedge (which we also reduced slightly). 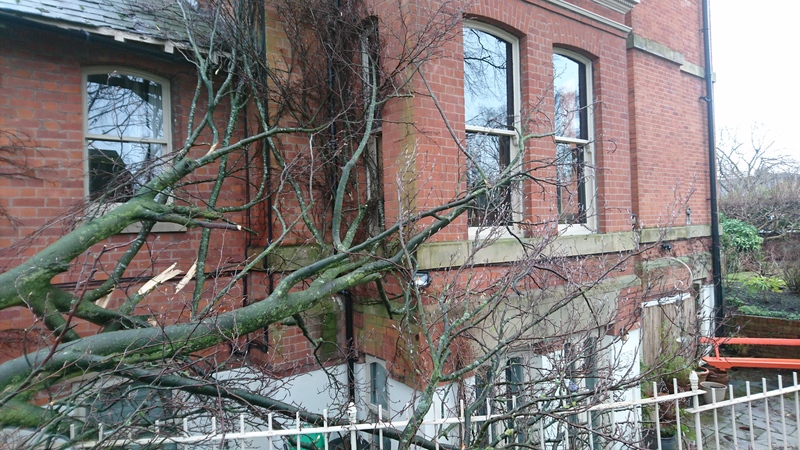 The breakfast diners at this guest house got a surprise in last year’s storm when a large section of beech tree came crashing through the window, causing minor damage. 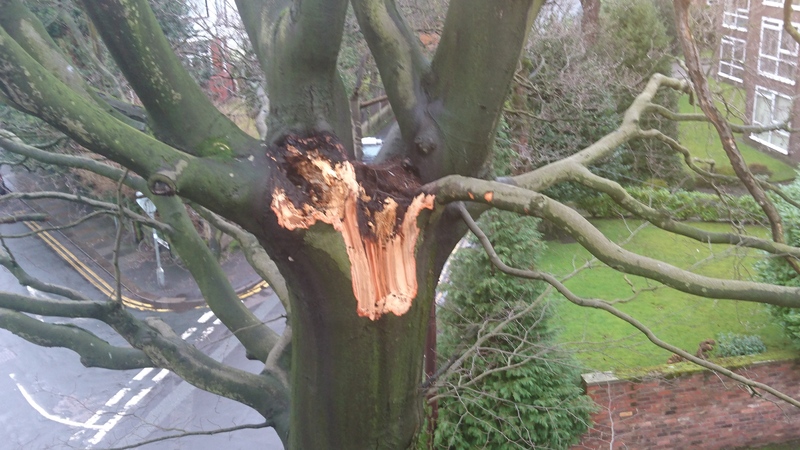 No one was hurt in the incident thanks to the loud cracking noise as the stems broke from the trunk alerting the diners to the imminent danger. 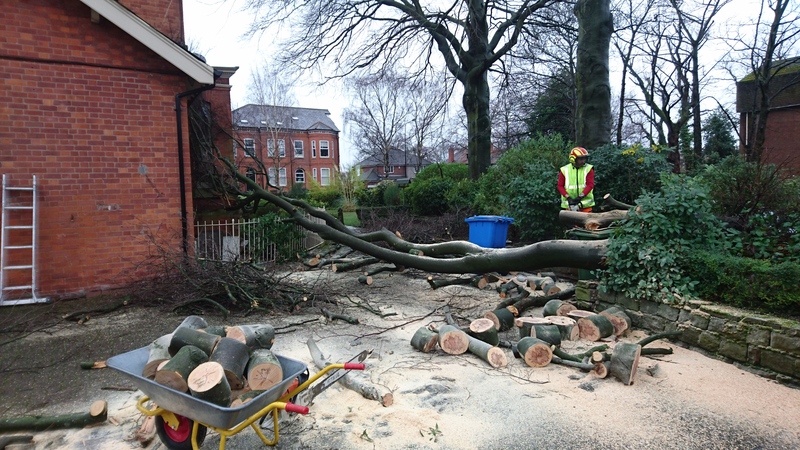 We were tasked with clearing away the fallen stems without causing any further damage to the building. 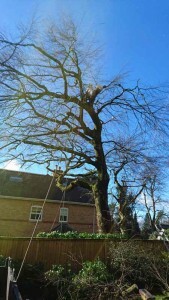 There was also some damage to another beech tree which we tidied up. 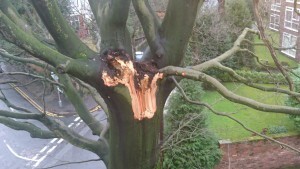 You can see here the points where the two stems broke away from the trunk after the storm. 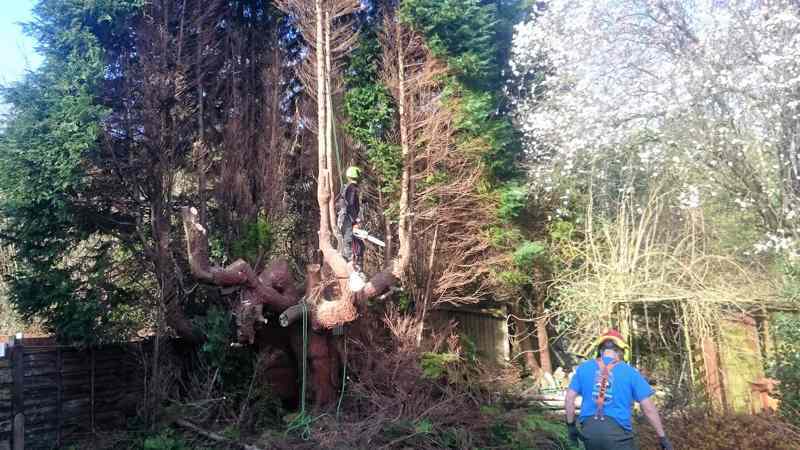 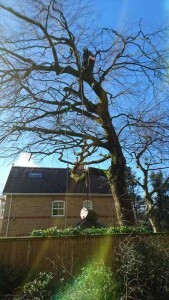 Decaying beech limb removal in Bowdon. Removing this limb was necessary to stop the spread of internal decay. 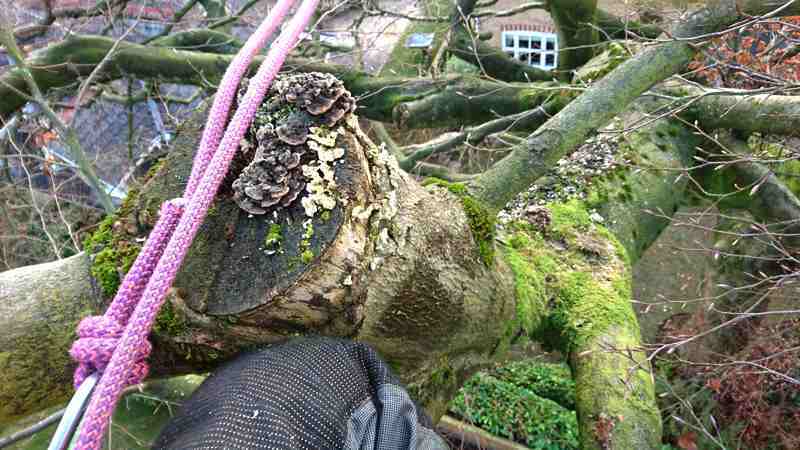 The decay was evident externally from the fruiting fungal bodies on top of the limb and the areas of necrotic bark. 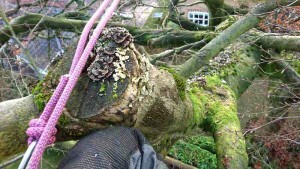 This was discovered when doing some scheduled pruning of the tree to keep the size and spread of the crown in check. 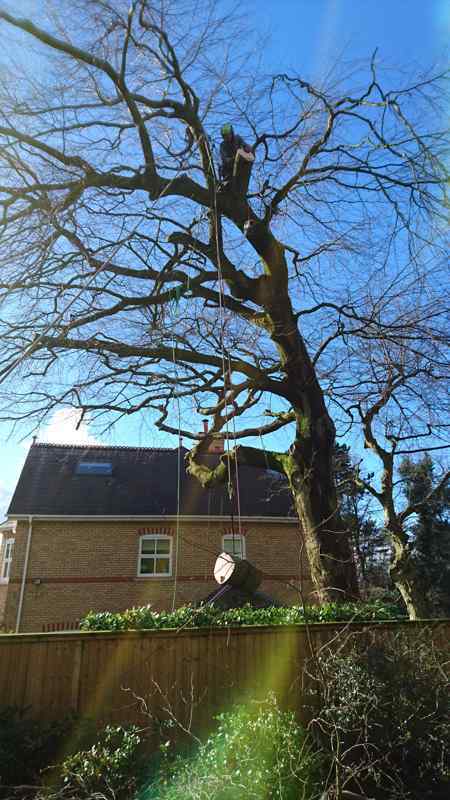 The tree was subject to a TPO so we applied for permission with the Council to remove the decaying limb back to sound wood. 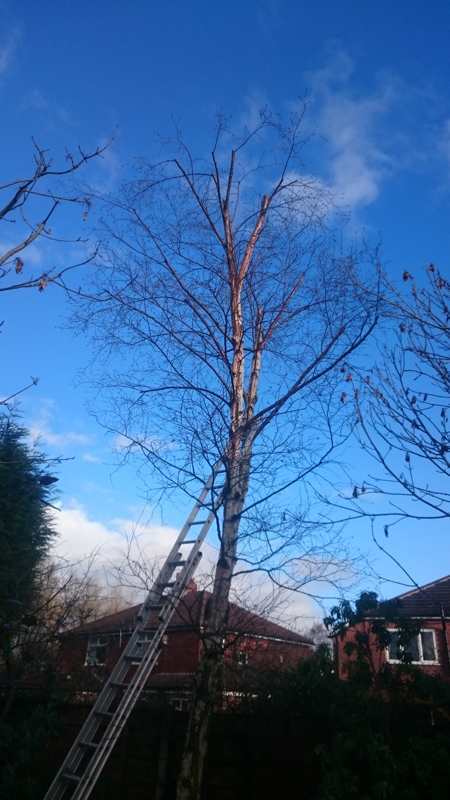 The final cut was done in a way that will allow the wound to eventually heal over, and will hopefully prevent any further fungal attack. 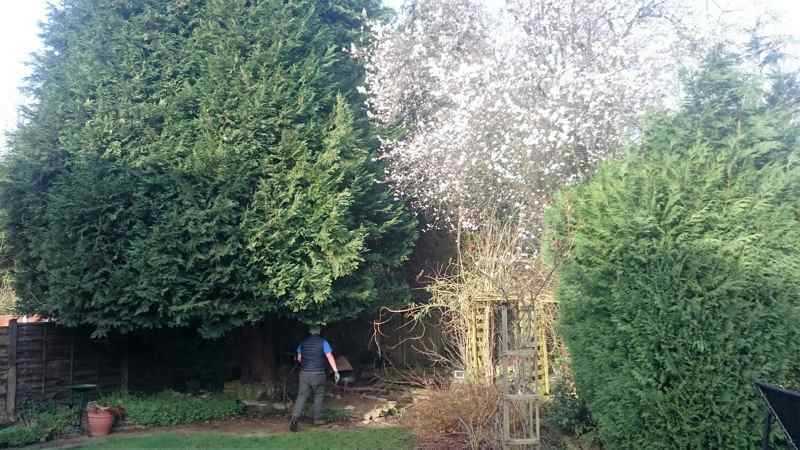 These conifer trees growing in a back garden in Sale had been reduced before, but were starting to get a bit too large for the space. 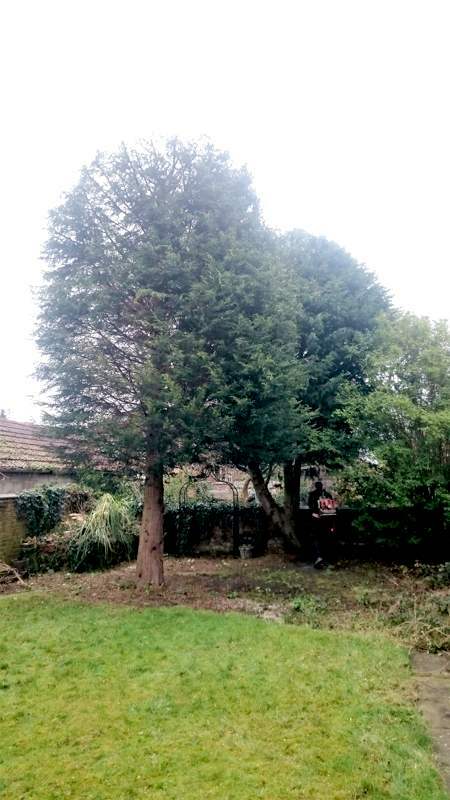 The customer didn’t want their garden getting too shady so we reduced and trimmed the trees to keep their height and spread in check. The conifer trees were beginning to shade out the garden too much. Time for a trim and reduction. Our customer was concerned that the two mature previously pollarded poplars at the back of their rear garden were getting too large for the space. 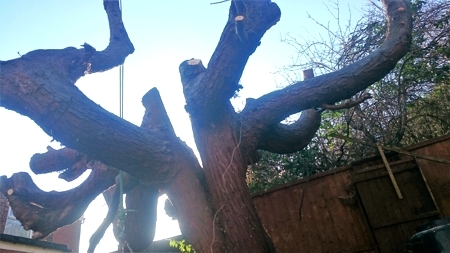 They were blocking out a lot of the light to the garden and the feeling was that they had been pollarded too high previously. 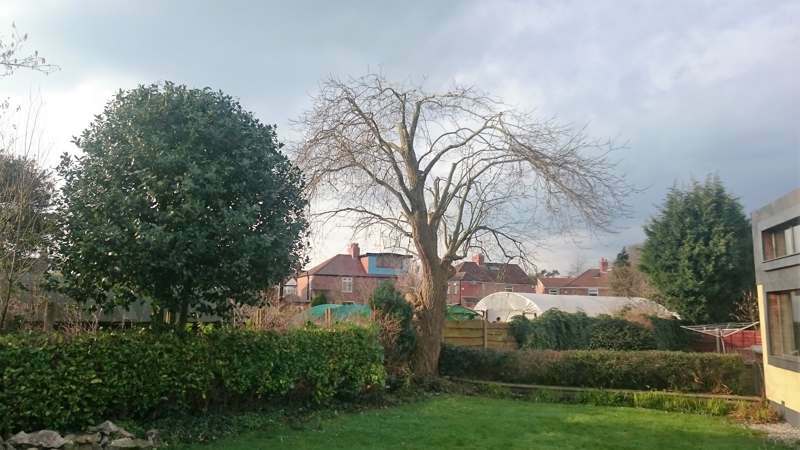 We re-pollarded them at a lower height to allow much more light into the garden whilst maintaining the much appreciated screen at a lower level where it was needed more.